There are occasions when building a class-leading car involves pioneering new technologies, catching the eye with bold styling and combining ideas in a way never seen before. Hyundai's second generation i10 citycar plotted a slightly different path when we first saw it in 2012. It's certainly up to date, smartly shaped and cleverly practical, but its main draw is probably the way you'll find it just does the basic things really, really well. If you're looking for a used citycar from the 2012 to 2016 era, there may be more exciting urban runabouts than this on your radar, but there aren't many better ones. 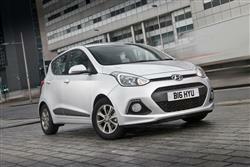 Hyundai's i10 has always been one of this country's very best selling citycars. With the original MK1 version, that was mainly down to affordable pricing. With this MK2 design though, this Korean contender aimed to claim its place in the nation's affections on merit. Sure enough, at launch in 2012, it was recognised not only as being very good value, but also as being spacious and versatile, these being the three priorities that buyers always prioritise in the market's smallest segment, one of the very few in which you can expect the sales leader to also be the best car. Buyers in search of an urban runabout, you see, can't be bothered with the snobby image issues that restrict Hyundai sales in larger market categories. The Korean brand has always had a real opportunity for sales growth when it comes to vehicles like this - one that the company has grabbed with both hands over the last couple of decades. True, its early citycar efforts - the curiously quirky Atoz of 1998 and the Postman Pat-like Amica that almost immediately replaced it - were better suited to Far Eastern tastes than European ones. But by 2008, Hyundai was getting the hang of what Western families were looking for, bringing us an i10 model that offered supermini style in a smaller, cheaper, more agile and more versatile package than anything we'd seen before. Sales took off, boosted in the UK by the government Scrappage scheme, and across Europe, nearly half a million i10s found happy homes. Fast forward to 2013 though and Hyundai's headaches were increasing. Despite a 2011 facelift, the original version of this car was struggling as mainstream brands piled into the citycar segment led by the design we know either as a Volkswagen up, a Skoda CitiGo or a SEAT Mii. With Fiat also revitalising its offerings and Citroen, Peugeot and Toyota about to do so too, a second generation i10 model was needed that could take a big step forward. In many respects, this MK2 model managed to do just that. It sold until late 2016 when it was heavily facelifted. There used to be only two ways you could style a citycar. One was the small and cute approach championed by models like the Fiat 500. The other represented the more versatile and practical option promised by contenders like the original MK1 version of this i10. In the last few years though, the waters have been muddied here, the 2011 Volkswagen up/Skoda CitiGo/SEAT Mii design proving that style in this segment could be practical and practicality could be stylish. With the bar raised in this way, when it came to creating this second generation i10, Hyundai's pen men realised they'd need to bring us more than just another short, tall, practical little runabout. To be fair, they knew that anyway, smart design already the number one reason for the company's increasing market share, with models across its range shaped by a flowing so-called 'fluidic sculpture' styling philosophy that continued here. Does it work? You be the judge. It's certainly a step forward from the sensible boxiness of the original MK1 version, though stops a little short when it comes to ultimate city chic. In part, that's due to Hyundai's preference for this to be practical transport rather than just another urban trinket. Which perhaps explains why this is the longest car in its segment from this era: at nearly 3.7m, it gets within 20cms of a supposedly much larger Fiesta-shaped supermini from the time. Which is not to imply this car to be lacking the kind of individuality that recently has become so important in this segment. On the contrary in fact. Take the front end where you get the sort of big, trapezoidal air intake that'd normally be found on a sports coupe. And complex smeared back headlight units that flow into a sharper side moulding designed to give the profile of this design a bit more shape, aided by a blade-like swage line that runs through the door handles. The rear section's quite smart too, with neatly integrated tail lamps that bite into a rear tailgate that rises to reveal one of the largest trunk openings in the segment and a 252-litre total boot capacity that's one of the very biggest in the class, 10% larger than the MK1 i10 could manage and easily enough to equal the Volkswagen up! and its design clones. Again, we're veering into supermini territory here, that figure just 10% less than you'd get in a Ford Fiesta, and more pertinently, around 50% more than you'd get in a Toyota Aygo, a Citroen C1 or a Peugeot 108. One of the reasons the cargo area is so big is that there's no spare wheel as standard, just a mobility kit, though many original owners paid extra for the added security of a space saver spare. The rear seats split and fold but there's not a totally flat load floor and that makes loading heavier items a bit trickier. Still, it's hard to grumble with the 1,046-litres of available space on offer. Of course, whenever you get a decently sized boot in a car this small, there's always the fear that rear seat passengers will pay the price for it. Especially in this case where most of this model's exterior length increase has been swallowed up by the need for an increased front overhang to meet pedestrian impact legislation. In fact, once you've entered through the wide-opening doors, you'll find a decent level of roominess for this class of car, providing you stick with the carriage of just a couple of adults. True, the sharply rising window line might not prove popular with very small children, but they won't complain about the legroom on offer. Even with a couple of six-footers installed in the back, front seat occupants shouldn't have to compromise space to accommodate them. We'd also point out that unless you go for the frugal Blue Drive model i10 variant, three belts are provided in the back - you only get two in many other citycars, which would be seriously annoying for family folk with three kids. And up front? Well it feels spacious here too, with head and elbow room also plentiful by class standards. It's pretty easy to find a comfortable driving position, despite the fact that the wheel only adjusts for height, not for reach. You'll find it a bit annoying though, that you can't comfortably adjust the seat height without opening the driver's door. The dashboard is as logically laid out as you'd expect from a Hyundai and while some of the plastics are a long way from the fashionable soft-feeling materials that some brands provide, you know what? It doesn't really matter in a car like this. Do you really want to be introducing the weight of a huge slush-moulded fascia into a citycar? Exactly. Anyway, the key touch points seem pretty nicely fabricated to us, with steering wheel, gear lever and buttons on the dash functioning with greater quality than you'd normally have any right to expect at this price point. In fact, there's an uncannily Germanic feel to them, which isn't surprising when you remember that the Fatherland is actually where this car was designed. All right, so you could still argue that the overall style of this interior isn't perhaps quite as slick as you'd find in, say, a Volkswagen Up, but it's not far off. It would be nice to have the kind of colour infotainment touchscreen you get in some citycar rivals though. The simple dox matrix display offered here is clear enough but a little old-tech. Still, the important stuff's been carefully thought through. Cabin practicality for example, which is why you get a huge cubby in front of the gear lever and a glovebox big enough to hold something other than just the owners' manual and a packet of Polos. There are well-sized doorbins too, big enough at the front to hold a proper 1.5-litre bottle of water - or a 0.6-litre bottle if you're seated at the rear. We came across plenty of very satisfied i10 customers in our ownership survey, but inevitably, there were a few issues reported. A recognised fault relates to crunching gearchanges and a general difficulty in selecting reverse; look for that on your test drive. One owner we found had had clutch-related issues. Another had had to deal with creaking noises coming from the suspension. One found that his car's stop/go engine system ceased working. And there were several reports of handbrakes that wouldn't properly hold the car on steep slopes. In one case, the electric window switch console failed. And one owner found the brake discs rusting up on a regular basis. (approx based on a 2013 i10 1.0 - Ex Vat) An air filter costs around £10-£12 and an oil filter costs around £3 to £5. Brake pads sit in the £25 to £40 bracket for a set and brake discs sit in the £40 to £52 bracket, though you could pay up to around £64 for a pricier brand. Wiper blades cost in the £4 to £10 bracket. A replacement wing mirror glass will cost you around £10. There are a few things you want to tick off as soon as you get yourself seated behind the wheel of a good citycar. The first is visibility. If you're going to be jinking from lane to lane, you need to great all-round sightlines. This i10 scores well in that regard, with good mirrors, windscreen pillars that aren't too obtrusive and a fairly high seat height. Point two - steering. If there's one thing that instantly takes the shine off a citycar, it's a heavy, unresponsive feel at the helm. The i10's rack is quick, accurate and very light. And the third thing you need to look for is a small turning circle. And this i10 certainly answers that call. The 9.56m turning circle requires fewer than three turns of the wheel, lock-to-lock, so if you spot a parking space on the other side of the road and check it's all clear, you'll find that this i10 can dive in quickly. Another area where this Hyundai steals a march on some of its rivals from the 2012 to 2016 era is in offering a choice of engines. Many citycars from this period come with just one powerplant and then a whole multitude of trim levels to disguise that fact. This i10 is available with both three and four cylinder units, respectively 1.0 or 1.2-litres in size offering a choice of either 66 or 87PS outputs. As you might expect in this corner of the market, we're talking petrol-power in both cases: most car makers long ago twigged that budget buyers in this segment don't want to pay the extra for a diesel engine that won't financially justify itself over the limited urban mileages likely to be covered. Often, we'll recommend going for a bigger powerplant in modestly-powered cars of this sort but in this case, there's a lot to be said for the 66PS 1.0-litre unit. It's of course lighter than the 87PS 1.2, yet virtually as quick for town driving. It even makes quite a pleasant noise. Of course, put it on a test track under the unyielding scrutiny of some data logging performance monitors and the 14.9 second sprint to 62mph doesn't appear that impressive, and the 96mph top speed isn't going to get it onto the cover of evo magazine. Trust us though, it feels quite sprightly enough when it's in its city element. The 1.2-litre engine is a tad faster, but as we've suggested, the difference is marginal. Hyundai says it'll get to 62mph in 12.3 seconds and top out at 106mph, in other words a level of incremental performance that to us seems fairly academic. But we're getting off the point here. The i10's never been about straight line go. Don't take that as meaning it's a dull drive. Ford's original Ka was a tiny urban runabout that sold for years largely on the basis that it had very little power but was great fun to pedal about in, and this i10 the has enough about it to offer keener drivers a bit of fun behind the wheel. The key to this is its suspension. There's actually nothing particularly clever in its basic setup. You get a pair of struts up front and a torsion beam rear end, but as is always the case with these things, it's the details that count and there's a reasonable degree of suppleness to the ride that irons out the worst city streets can throw at it. That's the easy part. Combining that with decent body control when you're pushing on a little bit harder is an altogether tougher ask, but credit where credit's due to the chassis engineers at Hyundai's German engineering centre. Thanks to this MK2 i10's stiffer chassis and lower centre of gravity, turn-in is crisp, although the downside of that effortless steering is that there's not a great deal of detailed feedback at speed. It's not notably worse than many of its key rivals in that regard though. The other minor issue we'd raise is that it's not the quietest car at speed, although criticising a tiny citycar for its high-speed refinement feels a bit like quibbling about how poor a Lamborghini is for a visit to IKEA. To be fair, Hyundai actually put quite a bit of work into reducing Noise, Vibration and Harshness. To that end, this MK2 i10 got beefier hydraulic mountings for the engine, a triple-layer dashboard bulkhead with a sound-deadening panel, dual door sealing strips, and two measures to reduce wind noise - a redesign of the door mirror mounts and a move of the radio antenna further towards the back end of the roof. The Koreans claim that at 65 decibels on rough surfaces, this car is quieter than key rivals and at lower speeds you could argue that. Get on a motorway though and you'll find quite a prevalent hum in the cabin at around 70mph. We've no issue though, with the quality of the manual gearshift action. It's light, crisp and feels like work has gone into matching the consistency of weighting of clutch and gearstick movement. Hyundai has also made the brake pedal action very light, so do bear that in mind if you're getting into the car for the first time. Gently does it is the best advice when you first come to use the strongly servoed middle pedal. The big draw for some (possibly older) buyers is the fact that the 1.2-litre variant can be had with four-speed automatic transmission. Choose the auto for effortless city driving by all means, but bear in mind that it does make the car slower and thirstier than the 1.2-litre manual and hikes the carbon dioxide rating up quite significantly. Citycars have evolved. These used to be models people went for because they had to. Now, so often, they're little runabouts customers own out of choice. For all the industry plaudits the first generation i10 received, it wasn't a car you'd ever feel especially joyful about owning. But specified correctly, this second generation version might be. Here, we've an A-segment contender that's everything it needs to be - and pretty much everything a model of this kind can be: as cheap, frugal, clean and practical as it was in first generation form, but in MK2 model guise featuring greater quality and character thrown in alongside a more precise, European feel. Other direct citycar competitors from the 2012 to 2016 era can offer this too, but do your sums on the spec and you'll find that nearly all of them are more expensive. Which wouldn't be an issue if they were delivering lower running costs, stronger build quality or more interior space than this i10 can offer. But they're not. This Hyundai can either match or beat its rivals in all of these areas. Which means that if you're shopping in this segment, you have to consider it.